I can't seem to get my formula working. The out of the box [Modified] and a custom [Published Date]. 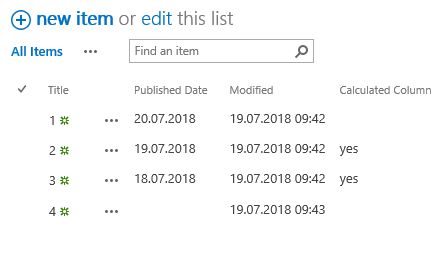 The published date is empty until filled by a workflow. What I want is a calculated column called Republish which says yes if [Modified] is greater than [Published date]. I'm struggling with the ISBLANK condition. Can anyone help me? You can achieve this with this formula. Be aware that this formula is created in a German language SharePoint. I am not sure if English SharePoint uses semicolon (;) or comma (,) to seperate formulas. So if you get a formula error just replace the semicolons with commas. If this solution helps please mark as answer/vote! Not the answer you're looking for? Browse other questions tagged date-time calculated-column-formula or ask your own question.